It's not what you push…it's what pushes you! Take your valuables with you everywhere you go with these stylish bags that you can carry comfortably under your wheelchair seat. 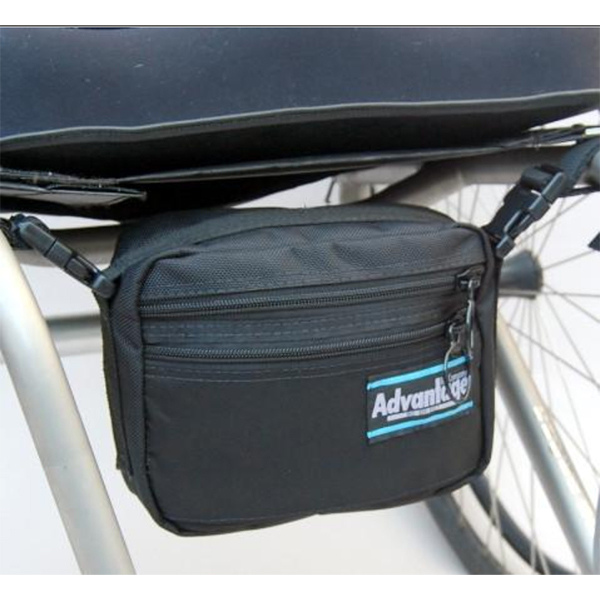 Let keys, your phone and even important documents you need to have like your identity card or even your money be tucked away safely within your reach in the Advantage Wheelchair Deluxe Down Under Bags. The bag comes with fantastic features that make it an ideal companion as you go about your everyday tasks whether at the workplace, out shopping or even on a day of fun out. The bag has a secure snapping attachment that ensures your valuables do not get lost when they fall out at any time. It comprises of one large main compartment with a smaller front pocket. Both have strong zippers that secure your valuables on every ride. The zippers are easy to open, you can easily reach out for your bag and zip it open in a second in fact with one hand (thanks to the nylon straps that it is made of) to find whatever you need anywhere without a struggle. It has quick release latches on both sides; this makes it easy to disconnect the bag especially when going through Airport security checks. It has got tough zippers and tough straps; generally, it is a well-made bag. The bag is made of good quality material that can stand harsh weather like snow and rain. The bag is wide and deep to take everything you need for the day at your reach. The straps don’t cinch so tightly, but that is not a major issue, you may prefer it that way or have it fixed to your liking. Get this excellent easy to install, great capacity all round bag at Sportaid at pocket-friendly prices. And in case you need to consult about how it works and how you can have it delivered to you do not hesitate to contact their amazing customer support team who are friendly and responsive. They will be happy to serve you for at Sportaid it is all about the customer.